President Uhuru Kenyatta and Nasa leader Raila Odinga shake hands after a joint press conference about the country's growth, at Harambee House in Nairobi on March 9, 2018. 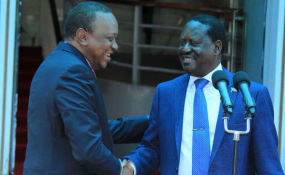 If you have never heard of political handshakes, then you possibly believe it is a coinage the Kenyan media used to refer to the March 9, 2018 rapprochement between President Uhuru Kenyatta and ODM leader Raila Odinga. Yet handshakes have been part of the world's political culture for centuries. As a friendly gesture, a handshake is not a new phenomenon. Some historians say that the handshake was used by military adversaries to show that the hands held no weapons, with each 'handshaker' offering their arms to the other to certify that there were no daggers hidden under the sleeves. In recent history, the handshake has acquired an iconic significance as a symbol of détente and as a promise of honesty, openness and trustworthiness between political adversaries. One of the most famous handshakes was between American President Richard Nixon and Chinese leader Mao Zedong. In 1972, at the height of the Cold War, President Nixon travelled to China in an effort to normalise relations between the two countries. President Nixon was invited to Chairman Mao's house at Zhongnanhai in Beijing where they held a one-hour meeting. They then shook hands in what is today recognised as one of the most significant handshakes in history. It was unprecedented that the leader of the Capitalist world would shake hands with the greatest Socialist leader whose country America had refused to recognise. Similar handshakes between adversaries have been exchanged as a sign of cessation of hostilities and a commitment to the establishment of a peaceful future. In 1979, the President of Egypt, Anwar Sadat, shook hands with the Prime Minister of Israel, Menachem Begin, at Camp David, the American President's retreat. The peace between their countries has held to date. In 1985, American President Ronald Reagan shook hands with his adversary, leader of the Soviet Union Mikhail Gorbachev, in Geneva, Switzerland. The handshake thawed the relations between their two countries, and opened up an era of cordial relations that saw an end of the Cold War. Closer to home, in 1994 President Nelson Mandela shook hands with the leader of the dominant white minority party in South Africa, Frederick de Klerk, at Union Building in Johannesburg, and begun a working relationship that tore down the structures of apartheid and established a previously unthinkable black majority rule -- and today's "Rainbow Nation". Politicians have however always shaken hands, and many times pretentiously. It therefore takes more than a wringing of each other's arms to make a meaningful political handshake. There are common characteristics in all significant political handshakes. First, handshakes are between two people who represent the opposite sides of a political situation. The two persons involved in such a political handshake are invariably representative of the extreme poles -- black and white, minority and majority, capitalist and socialist, Arabs and Jews, conservative and liberal, et cetera. Secondly, handshakes are engaged in when these two opposite poles are at the acme of their acrimonious relationship. For Reagan and Gorbachev, it was the nuclear arms race. For Sadat and Begin, it was the Arab-Israeli wars. For Mandela and De Klerk, it was the state-sponsored violence that swept through South Africa. It is the acrimony that gives a political handshake its significance because it resolves a standoff. And in doing so, it brings together not just the two protagonists but also their followers. It is therefore always the case that the persons engaged in such a handshake are the politicians who have the greatest and undisputed influence. Indeed, these politicians are a physical embodiment of the hopes and fears of their followers. Their personal political rivalry also reflects the rivalry of their supporters. It is from this that you get the iconic nature of the handshake. It immediately symbolises a cessation of acrimony, a first step towards reconciliation and a promise of constructive engagement. One can now understand why it had to be Mr Kenyatta and Mr Odinga doing the handshake. They both represent the two poles between which this country has been divided over the last 50-plus years. The rapprochement between the two symbolised a clear intention to break away from the past and a commitment to build a different future. In fact, had the President and Mr Odinga turned their handshake into a multilateral exchange of goodwill, they would have watered down the symbolism and political significance of their rapprochement. This, however, has been the most common criticism of the Uhuru/Raila handshake -- that others were not involved. But this criticism is not the real reason for the disquiet among some people. While everyone has welcomed the handshake and agrees that it has changed the present reality to the benefit of the country, there remains some suspicions and sometimes outright hostility. One reason for this is that handshakes are politically disruptive. Politicians practice their trade by understanding their environment and making decisions on the calculations of how this environment will change in the foreseeable future. Handshakes disrupt this so drastically that many politicians are unable to foresee the future. The natural tendency then becomes to try and contain the new environmental factors and manipulate them into a reality that one can work with. Failing that, the common solution is to destroy the new environment and revert to the more predictable status quo the politician has become adapted to. In the status quo, the politician knows his friends, his enemies, the friends and enemies of his friends, and the variables that determine who remains loyal and who defects. After a handshake, sworn enemies become friends and the factors that determined relationships become irrelevant. This is the new reality that President Kenyatta and Mr Odinga have created with their handshake. Every political calculation that had been made based on the assumption of their continued rivalry is now invalid. To many politicians, this is very disruptive and those who have been unable to think their way around the new reality have attacking the handshake as their only option. President Kenyatta and Mr Odinga have, therefore, had to deal with serious backlash from their respective constituencies. But this is not new. Phenomenal handshakes have always generated serious backlash to their principals. Regrettably, history has examples of leaders who have paid the ultimate price for attempting to resolve historical rivalries and create a different future. When Yitzhak Rabin agreed to shake hands with Yasser Arafat on the lawns of the White House in 1993, he annoyed many conservative groups in Israel that accused him of betraying the biblical heritage of the Jewish people. Just shy of two years after the handshake with Arafat, Yitzhak Rabin was assassinated by an Israeli ultranationalist. Twelve years before, President Sadat had met the same fate for trying to make peace between Egypt and Israel. After his handshake with Israeli Prime Minister Menachem Begin in 1979 at Camp David, he was accused of betraying the Arab and Muslim cause and a fatwa was issued on him. He was assassinated two years later by fundamentalists in the Egyptian army. In South Africa, Mandela's legacy is still mired in controversy following his handshake with De Klerk. He is accused of betraying the cause of Black South Africa and choosing negotiation over revolution. Handshakes are therefore not simple acts of drama as some portray them. They require great courage and statesmanship. They call for great sacrifice. Even with the best of results, they come with expensive political prices. One thus wonders why people still do them. Why would President Kenyatta and Mr Odinga agree to suffer all the criticism and outright hostility they are enduring as they pursue what some believe is unachievable? I believe handshakes are borne from a moment of enlightenment. It is a moment when all the right factors fall in place, when all the stars align. The protagonists, the contestation and the time in history are the most ideal and over that moment dawns a mutual realisation that a different future is not only desirable but also possible. And in spite of themselves, the two protagonists seize the day and begin a long and lonely walk towards that future. The author is joint Secretary of the Building Bridges Initiative Taskforce.